Hardware as a Service (HaaS) is a service provision model for hardware that is defined differently in managed services and grid computing contexts. In managed services, HaaS is similar to licensing. In grid computing, HaaS is a pay-as-you-go model. In each case, the HaaS model is similar to other service-based models, where users rent, rather than purchase, a provider's tech assets. Our HaaS packages are designed to offer you more - Hardware & Software to manage your business at a price that is affordable on a Budgeted Monthly Basis. You will know exactly what your IT costs are going to be without surprises that could break the bank. $169.00 per Month with 36 month subscription. Your new Point of Sale HaaS Restaurant system includes a ACT-POS Falcon X65 Small Form facotr computer terminal built with Intel 3220 Dual Core Processor, 4 Gigs of DDR Memory, a 60 Gig Solid State Hard Drive, HDMI Video Out, 10/100/1000 Ethernet Network Connection, Integrated Audio, Windows Embeded POSReady 7 Operation System, AVG CloudCare Antivirus and Keyboard and Mouse. 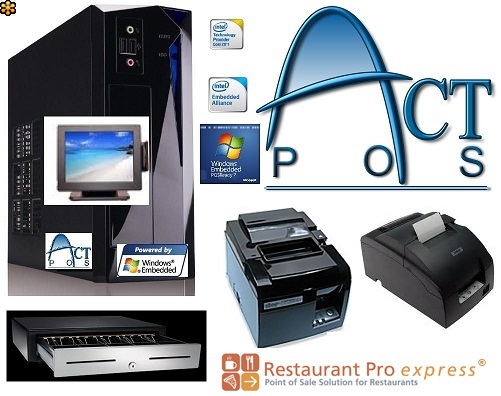 The entire package is loaded with 'RESTAURANT PROFESSIONAL EXPRESS' for Single Lane Point of Sale Professional Management of your operation. RPE works for Fine Dining, Quick Service, Casual Dining, Delivery and Take-Out. A few of the integrated features include: Loyalty Program, Gift Cards, Employee Time Clock, Inventory, Purchase Orders and more. Your new Point of Sale HaaS RETAIL system includes a ACT-POS Falcon X65 Small Form facotr computer terminal built with Intel 3220 Dual Core Processor, 4 Gigs of DDR Memory, a 60 Gig Solid State Hard Drive, HDMI Video Out, 10/100/1000 Ethernet Network Connection, Integrated Audio, Windows Embeded POSReady 7 Operation System, AVG CloudCare Antivirus and Keyboard and Mouse. 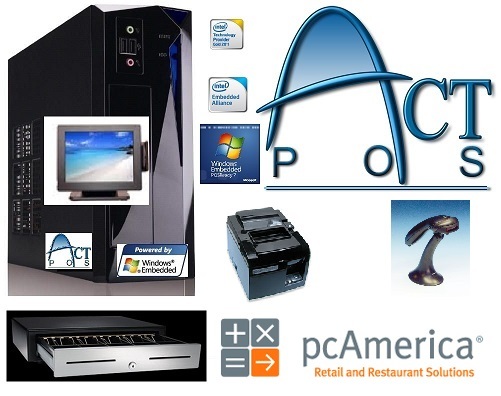 The entire package is loaded with 'CASH REGISTER EXPRESS PROFESSIONAL' for Single Lane Point of Sale Professional Management of your operation. CRE works for Apparel, Shoes, Cell Phones or Electronics, Hardware, Convenience Stores, Grocery Stores, Liquor Store, Wine Store, Beer Store and more. A few of the integrated features include: Loyalty Program, Gift Cards, Employee Time Clock, Inventory, Purchase Orders and more. Would you like to apply for a HaaS of Your Own? Contact us today (603) 627-8728 to learn more about how we can put it in your shop.